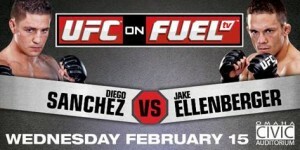 UFC on Fuel TV: Ellenberger vs Sanchez kept the ball rolling for Kamikaze Overdrive with a respectable 5-2 record, including another correct main event predictions taking Jake Ellenberger to outclass Diego Sanchez. The UFC on Fuel TV Betting Package cashed in for the third straight event with the Statastic Star Parlay paying out at $360, pushing the combined total winnings of the last 3 events to just over $1380. Make sure you don’t miss out on another opportunity to cash in and check out the UFC 144 Betting Packages along with the UFC 144 Fighter notes , also in the betting package area. -With one even to go Clouble has opened up an eight point lead but with 36 points still up for grabs at UFC 144 this is anyone’s game. Make sure you check back closer to the event for both competitor’s picks. -Jake Ellenberger looked good, but faded in the third which I think is more of a testament to how tough Diego Sanchez is. -Dave Herman, new look aside, seems to have all the tools to compete and probably won round 1 but there just seems to be something lacking, maybe killer instinct. -a correct prediction involving Stefan Struve evaded me for another time, dropping my Struve record to a dismal 0-4. This kid has talent and is still young, the development he continues to show indicates a promising future is ahead. -Simpson/Markes was a let down, but played out pretty close to my prediction with the majority of the fight taking place in the clinch along the cage. It is too bad that Simpon couldn’t put much together in either the 2nd or 3rd because his first round knockdown was the most significant part of the fight. -Stipe Miocic vs Christian Morecraft up nest? Bring Stipe along slowly and he should develop into a contender. -T.J. Dillashaw and Jonathan Brookins both represented TUF well, it is nice to see both the 135 and 145 pound divisions getting deeper. -Overall it was a decent show, I predicted Ellenberger/Sanchez as fight of the night which worked out nicely and going forward there is a lot of potential for the majority of the fighters on the card.